Saint Laurent SS16 collection gave a new twist to romanticism: women are moody, girls with attitude will blossom down the streets next spring, no matter if strange, tough or glamorously punk. 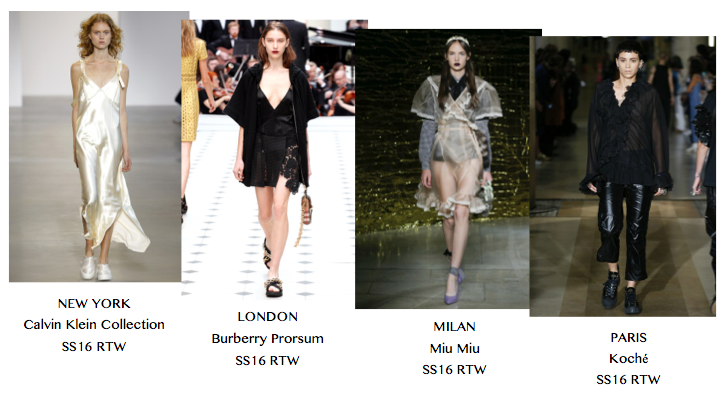 Named ‘Romantic Rebellion’, this trend is all about “material composition and textural amplification“. 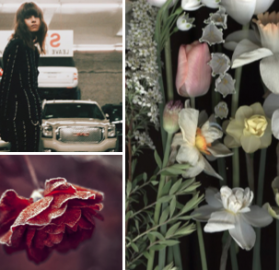 Florals are around the corner but “against dark grounds, either smudged, packed, placed, outlined or distorted“. 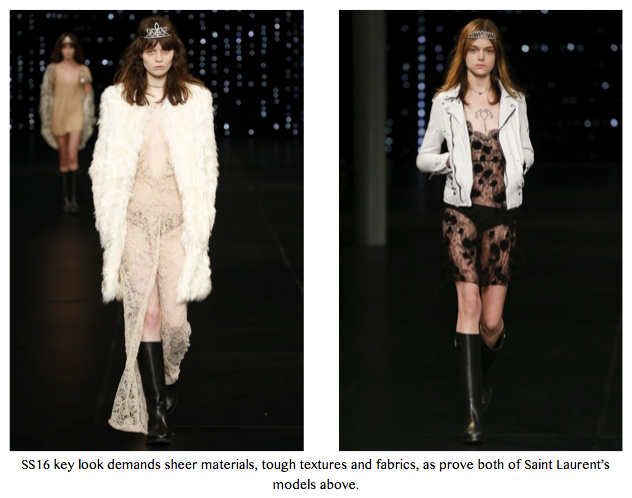 The Saint Laurent girl is not ashamed by the word ‘sexuality’. Underwear turns outerwear for SS16, reminding of the lingerie-inspired styles in the 1995s. 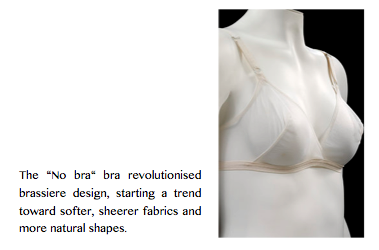 The Future Chic of Gernreich’s no bra bra’ “dismisses the idea of the dress as the foundation of the wardrobe“; so will do romanticism next year. 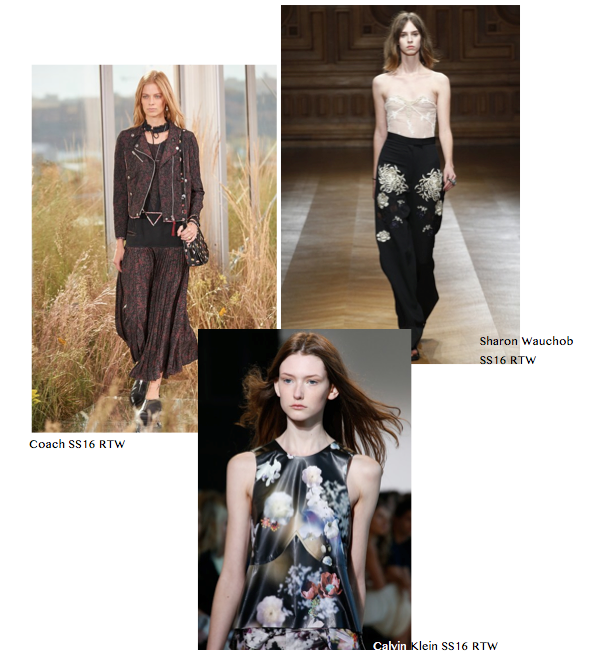 All the fashion capitals joined the Romantic Rebellion, promoting the hard/soft duality through texture and silhouette. 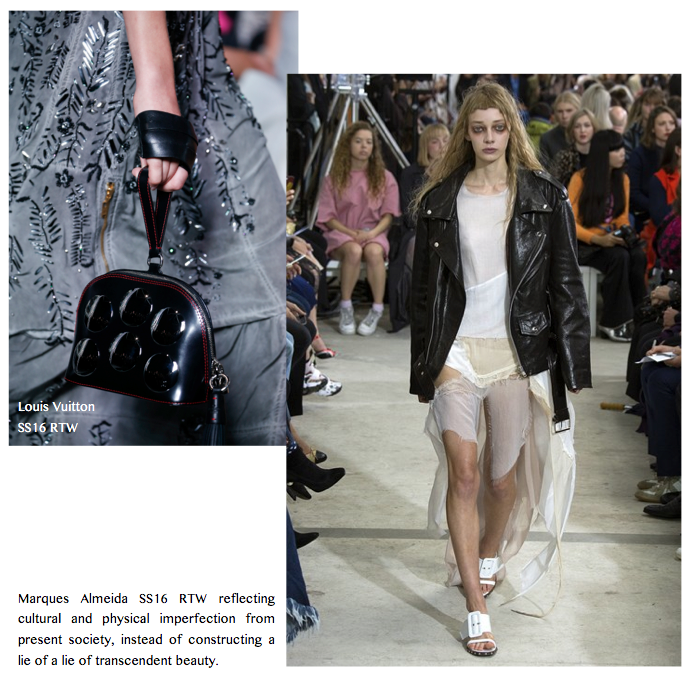 SS16 envisions nothing but re-invest nostalgia, signified of the early years of the 21st century fashion, “veiled in a cloud of nostalgia for styles past“. See-through clothing already went that far; there is no innovation. Alike Rudi Gernreich’s ‘no bra bra’ in 1965, SS16 ‘Romantic Rebellion’ draws simple lines on silhouettes, while conveying a more ambiguous societal message. 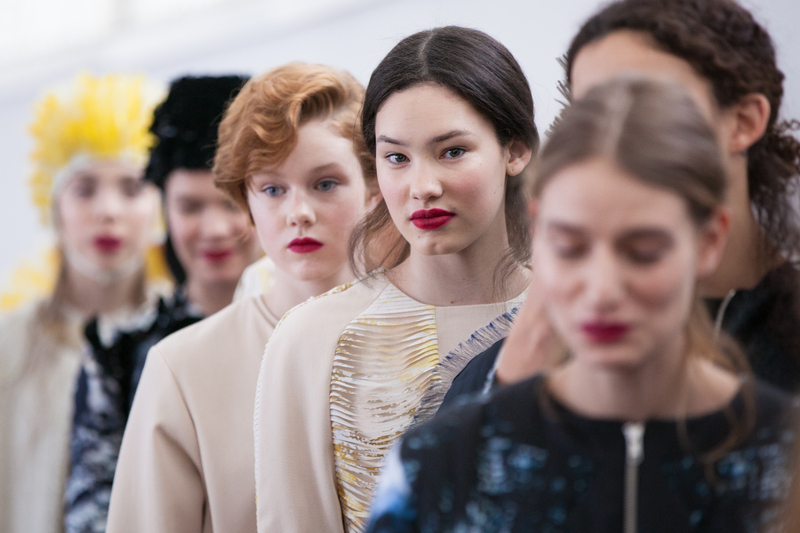 As “more youthful point of view to the New Romanticism“, Romantic Rebellion brings out little girls among professionally determined modern women, an undeniable reminiscence of Courrèges’ ‘coup de maître’ in fashion history. Referring to the anxiety of “the end of twentieth century [where] fashion became increasingly spectacular“ and conceptual, contradictions and ambiguity are strong signifiers of the 20th century as fashion started to “negotiate and theatricalise the shifting ideas and ideals of the century“– McQueen as ‘chef de file’. SS16 trendy association of dressed up and incomplete garment could denote the uneasy relationship to present capitalist consumerism. The post-internet era has blurred the boundaries between privacy and public: intimates become key pieces counterbalanced by loose but rigid materials, such as leather, fur, velvet, mesh and glazed surfaces, among others. Black’s predominance winks at the Punk movement’s history, similarly endorsing a process of both self-creation and self-destruction. Flesh as the only left thing to control, skin has become the new fabric. Influenced by technology’s hyper-fast pace, the 2016 Romantic Rebel woman naively dreams of re-connecting with the world outside.